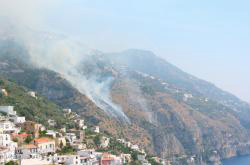 Today at 11 am a fire broke out between Furore and Praiano, the road to Amalfi was blocked. August is the season of fires on the Monti Lattari, that sometimes reach down to the Amalfi coast. When this happens, the only road along the coast is completely blocked, and Amalfi can best be reached by boat. You can read more here at Positano News.